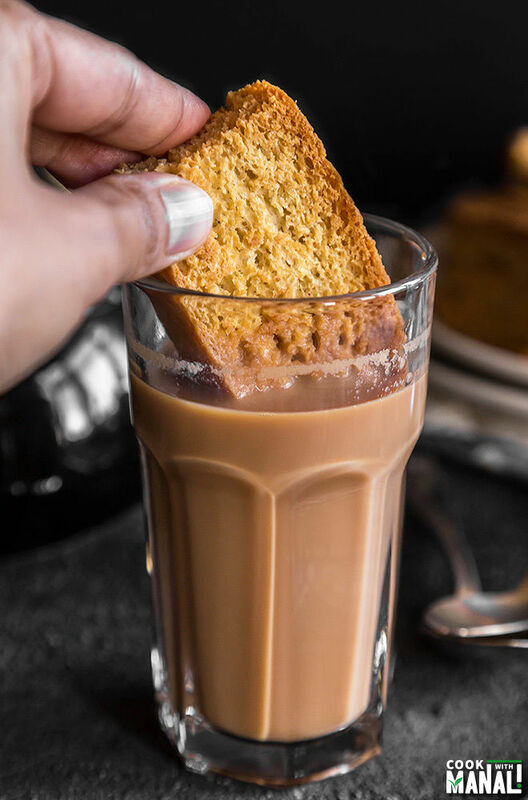 Crispy tea time milk rusk – this rusk recipe will give you the perfect milk rusks to enjoy with your chai! So I will tell you guys how this recipe came into existence. One day I was making pav bread for pav bhaji. While a batch baked in the oven, I was left with 2 more pav buns to bake. So once that batch was done, I popped these in the oven. Now because these were just 2 and I already had my big batch done, I totally forgot about them. I got busy in clicking pictures unaware that there was bread in the oven! Well long story short, I took them out when they were totally dark brown, a little less than being jet black. I went ahead and tasted them out of curiosity and I thought “wow these taste totally like the milk rusk that I have with my chai every morning”! I thought I could definitely tweak my pav recipe a little and make rusks. 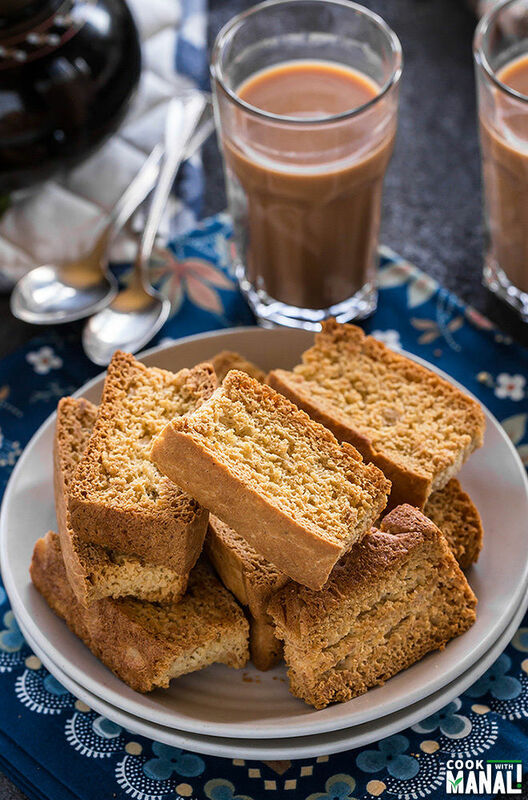 Since then, it has been on my mind to make these milk rusks and I am so excited to share the rusk recipe with you guys! 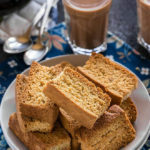 I already have a rusk recipe on my blog but that’s cake rusk which is very similar to biscotti. This is milk rusk which is basically bread which has been baked till it gets really crispy. It’s very lightly sweetened and flavored with cardamom and fennel. 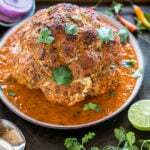 When I started this recipe, I thought since I have a baseline already I will get it in one go. But I was wrong. The first batch was really salty and also I baked them way too much. The rusks weren’t browning enough so I ended up increasing the temperature to 400 F degree which did not turn out to be a good idea in the end, they became super crisp. So I ended up throwing the batch and made the second one which was successful! Hurray! A super easy way to make rusks it to bake your store bought bread which rusk is basically twice baked crispy bread. Apply some butter on bread slices and place then in the oven till crisp but if you are like me and love baking from scratch then this recipe is for you. 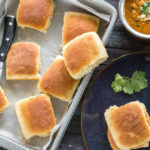 This rusk recipe makes exactly the type of rusk that you get in Indian stores and since it’s made at home, it’s obviously so much better. I flavored it with cardamom and little fennel. You can up the amount of these spices if you want a stronger flavor. These milk rusks are very lightly sweetened just like the one we get at stores. You may increase the amount of sugar if you like sweeter rusks. 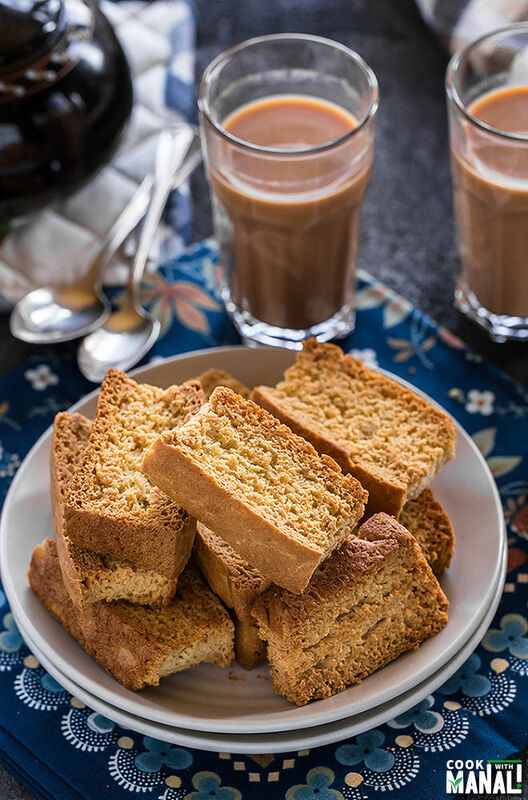 I hope you guys give this rusk recipe a try and enjoy homemade rusks with your chai! Yeah eating rusk is incomplete until you dip them in chai. Isn’t it? PS: Don’t forget to check out my homemade pav recipe. It’s my no-fail recipe and comes out perfectly every time! PPS: If you are new to yeast, always remember to choose a good brand of yeast and make sure the temperature of water is neither cold nor super hot. It should just be warm enough. And always be gentle with the dough and you will be just fine! Here’s a quick video on how to make rusk at home! 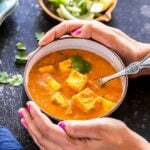 In a bowl mix flour, milk powder, 3 tablespoons sugar, cardamom powder, fennel powder and salt. Add oil to the flour and mix. Set aside. In a mug/bowl, take warm water, add remaining 2 teaspoons sugar to it and then add the yeast. Give a quick stir and let the yeast activate for 5-10 minutes. This is called proofing of the yeast. You will know your yeast is proofed/active when it’s all bubbly and frothy on top. If your yeast doesn’t turn up the way it is in the picture, it is dead. Throw the water and start over again. 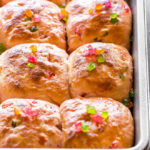 Do not add this water to the flour, the yeast will not work and you will get hard pav buns. Transfer the flour mix to the steel bowl of your stand mixer or you can do this with your hands. Add the activated yeast liquid to the flour. Knead the dough for 7-8 minutes using the dough hook attachment (or knead for 10-12 minutes using your hands). At this point I added additional 3 tablespoons of flour as I felt the dough was sticking a lot. You can do the same. Your dough is done when it looks smooth and springs back when you poke it. Transfer dough to a bowl and oil/butter it on top and on the sides as well. The bowl should also be coated with oil. Cover with a damp cloth and let the dough rise for 1 hour in a warm place or till it doubles in size. After the dough has risen and double in size, punch is to release the air. Knead the dough once and transfer it to a 9 inch square pan. Make sure to spray the pan with a non-stick spray before you transfer the dough to it. Using your fingers spread the dough into the pan. Cover and let rise in a warm place for another 30 minutes. Once the dough rises again, brush it with milk and bake at 350 F degrees for 27-30 minutes. Remove from oven and let cool a bit. Then cut into rectangular pieces. 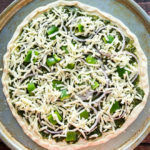 Arrange all the slices into a baking sheet lined with silicone mat or parchment paper. Bake at 275 F degrees for 30 minutes, then increase the temperature to 300 F degrees and bake for another 40-45 minutes. Keep turning the rusks every 15 minutes or so for even baking. Let the rusks cool and then store in an airtight container. Enjoy with chai! 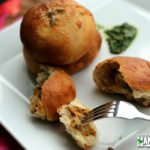 * Increase the amount of cardamom and fennel powder to taste. 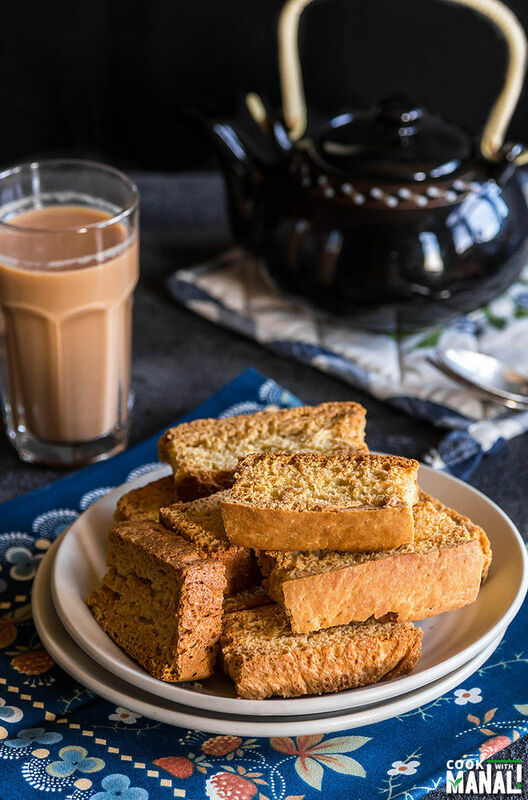 Crispy twice baked toasts, rusks are best enjoyed with chai! You will know your yeast is proofed/active when it’s all bubbly and frothy on top. If your yeast doesn’t turn up the way it is in the picture above, it is dead. Throw the water and start over again. Once the dough rises again, brush it with milk and bake at 350 F degrees for 27-30 minutes.Remove from oven and let cool a bit. Then cut into rectangular pieces. Let cool and store the rusks in an airtight container. Never heard of or had rusk…they look just like double baked bread we have over here. So crunchy! So I’m ashamed to admit that I’ve never heard of rusks. (Well, I have…Robbie eats rice rusks for a snack, but they don’t look like your version!) They sound sorta like a yeasted biscotti? Either way, I took a peak at the recipe…and I’m pretty sure I’d love these! The flavors in here are perfect, and you can’t beat a good dipping treat! Thank you dear Manali for this lovely, simple tecipe. I do like Tea Rusks and Cake Rusk. I was looking for a recipe for Eggless Tea Rusk, and I would like to thank you for posting your recipe. I will be making TeaRusks tomorrow, and I will let you know how I get on. Welcome Fiona! 🙂 Hope you like them, I will also post the eggless cake rusk recipe in the coming months! Wow!!!!!! 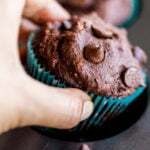 Amazing recipe !!!!! Thanks, for which I was awaiting since long. 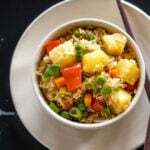 used for the recipe by you in ml or grams. And once more thanks for perfect recipe! Anything toasty and crunchy in the morning gets my full attention! Love these! you can skip the milk powder if you want..it’s for flavor..
Can I add milk instead of milk powder? Hmm you may but then you will have to adjust everything because wet to dry ingredient ratio will be different. I Was looking for eggless rusk from a very long time.. I cannot understand two 3/4 cups ?? Hi Maninder..it means 2 cups + 3/4 cup..so little less than 3 cups..